We are leading company and known in the market for offering a quality approved Indoor Basketball Court Flooring. Our Indoor Basketball Court Flooring is highly recommended for their usability in indoors and many more places. 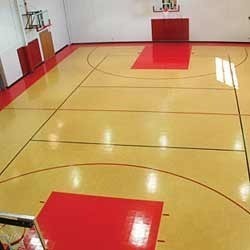 The offered Indoor Basketball Court Flooring provide realistic look and known for their fine finish. Sports India is a sole proprietorship owned organisation, (ISO 9001 : 2015 Certifyed Company) that has commenced operations in 2008, with zeal to outshine in industry. The company has indulged itself in Developer , Importer,Manufacturing, supplying and service provider a wide assortment of Badminton Court Wooden Flooring, Squash Court Wooden Flooring, Dance Flooring, Multi-purpose Court, Basketball Court, Volleyball Court, Sports Room Flooring, Sports Lighting System, Rubber Sports Flooring, Volleyball Court Flooring, Basketball Court Flooring, Synthetic Sports Flooring, Wooden Flooring and more. We are also renowned for offering trustworthy Wooden Flooring Installation, Sports Court Repairing and other Services. Over the years, we are following quality and client focused approach just to meet the expectations of clients and provide them only quality assured products. Advanced techniques and methods of production are incorporated by us, which have enhanced their efficiency and make them up to the upcoming customers’ preferences. Our products and services have got specialisation in the market for their matchless features such as easy replacement and installation, smooth finish, less maintenance, reliability and others. It is just because of the matchless characteristics as well as quest for quality that we have been successful in gaining overwhelming response from our clients attaining a distinguished niche in industry.